2018 has been a tumultuous year so far. While the largest of the large caps have continued to hold and even gain some ground, the small and mid-cap space has seen a correction. 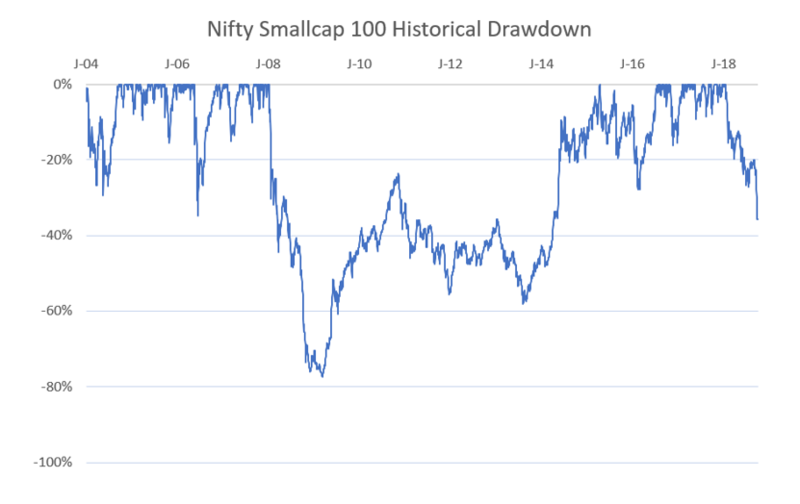 For example, the NIFTY Smallcap 100 Index peaked on 15th Jan 2018 and has since lost ~37% of its value in a drawdown that’s already close to 9 months old. 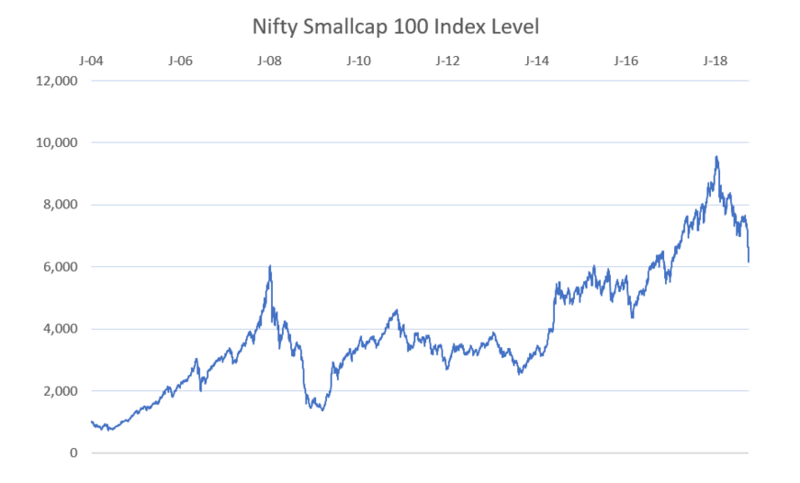 Interestingly, the NIFTY Smallcap 100 Index now is more or less back at its Jan 2008 level. Amidst this backdrop, our all-weather portfolio recommendation has held its own quite well. 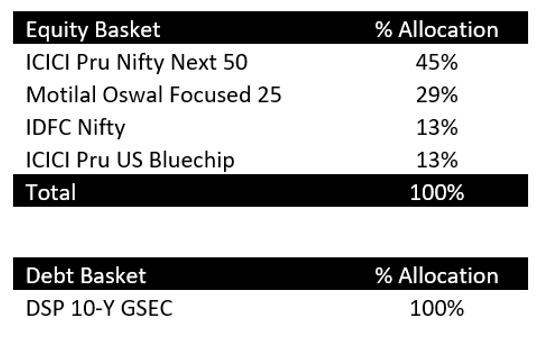 We recommended the following equity basket in Jan-2017. The funds in our equity basket have zero to minimal overlap and provide a low-cost well-diversified portfolio using low-cost index funds where possible. Then based on the user’s stage of life risk profile (married, kids, home ownership etc) and duration of goals, we recommend an allocation into Equity and Debt basket above. This is based on the time-tested Mutual Fund separation theorem, which states “any investor’s optimal portfolio can be constructed by holding each of certain mutual funds in appropriate ratios”. Overall our recommended portfolio has held up well to the market turmoil and we can see that diversification is clearly working. 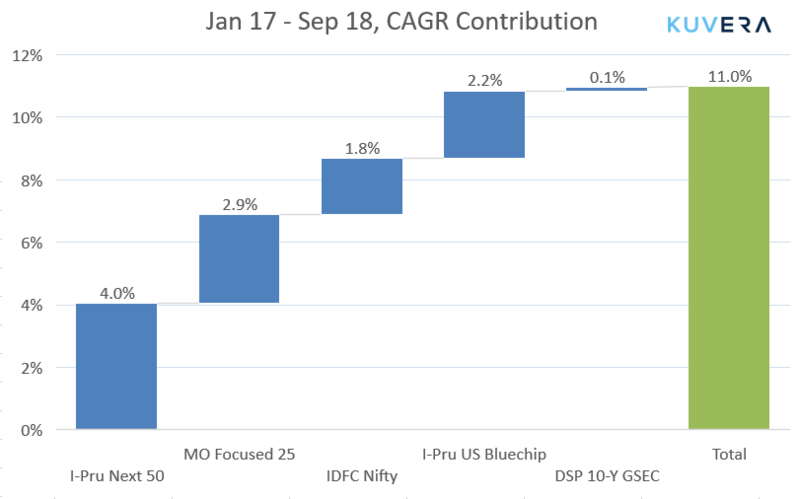 Our allocation to large caps and international (US) funds, which seemed contrarian when we made them, have shown their diversification benefits this year. This is not naïve diversification of naming 3 large cap schemes and 3 small cap schemes and so on and so forth. Our portfolio construction ensures that the investor is exposed to orthogonal sources of risk and thus overall portfolio variance is reduced considerably. The only miss is that we underestimated the pressure on the RBI to raise interest rates which impacted the performance of our long-term GSEC fund vs holding liquid or ultra short-term funds. Let’s take an example now of a 30-year-old user, with average risk profile and a retirement goal, for which we would recommend a roughly 85% Equity and 15% Debt asset allocation. Over the benefits listed above, the changes will lead to a net reduction of expense ratio of 7 bps in our equity basket and 10 bps in our debt basket. The new recommendation will start showing in our app and website starting today. If you are following our allocation, then we suggest you stop your SIPs in the existing schemes and start in the new schemes. The existing units already bought, can we be left as is or moved to the new schemes over time after confirming exit load and tax status. We are closely watching the small-cap space to see when the opportunity is right to start adding some direct small-cap exposure in our equity basket. For now, we are happy to wait. I found the article helpful. Below are my understanding on your recommendation. The recommendation to change 10Y GSEC fund to reliance liquid fund is a good approach. Even change ICICI nifty next 50 to UTI NIFTY next 50 may be a good decision, considering both are index fund (comparable return) and the UTI fund has minimum expense ratio and lesser SIP value. But, I do not understand the reason of recommending Download Data DSP Equal Nifty 50 Fund in place of IDFC Nifty Index fund. 3. IDFC Nifty Index fund has lesser expense ratio. It will be helpful if you can elaborate the reason for change of this specific recommendation. DSP Equal Weight index invests roughly 2% in each Nifty 50 company (it is an equal weighted index). 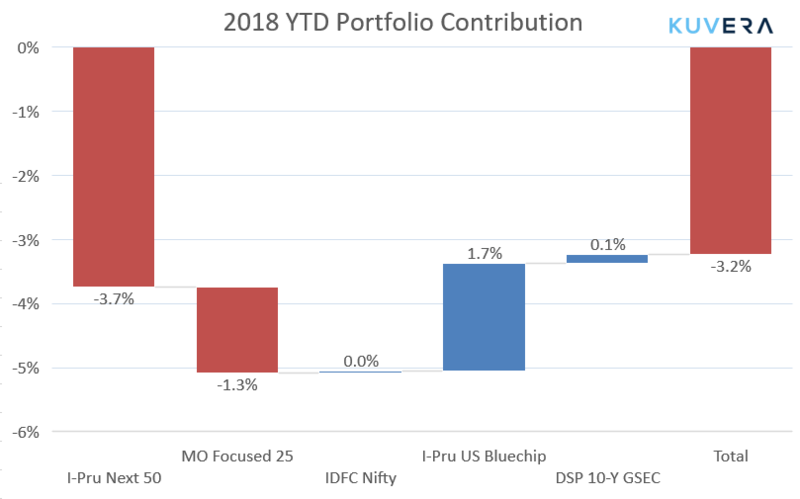 The reason we choose DSP Equal Weight Nifty fund instead of a plain vanilla Nifty index (IDFC) fund is because Equal Weight indices have outperformed their plain vanilla indices globally and in our back test in India as well on a risk adjusted basis. I beg to differ. IMHO, equal weight scheme require minimum 25 out of 50 stocks to perform better than rest to give positive result. This can not happen when Index is managed by targeting few stocks as we have seen in last couple of years. Equal weight works only when there is real broad based buying in market. A difference of opinion is what makes a market vibrant. In this case, though, there is overwhelming India and international evidence that Equal Weight (EW) indices outperform in all but a few market regimes. And since market regimes themselves are only known in hindsight, it is a better option to invest in EW indices rather than MW indices. Thanks Gaurav for your quick reply and explain the insight. This concept doesnot provide downside protection.In such case active mgmg may be better than active. It is absolutely hogwash that active management provides down side protection. It does not. Not in global markets and not in Indian markets. I prefer Parag Parikh Long Term Equity Fund for international exposure along with value investing. Your take. Sure, go ahead with it. The downside is it is not a dedicated international exposure fund, so you are dependent on PM to call India / Global allocation. Instead of liquid find, can we choose ultra short bond fund from Franklin? 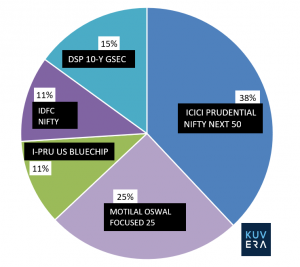 Why Motilal Oswal Most focused 25 fund included in this Equity portfolio. I can see some considerable overlap with other 2 index funds(UTI NN50 and DSP EQ). When people claim No downside protection with Index funds, then how to manage downside protection,if i choose to invest only with index funds. MO 25 is included as a concentrated portfolio even though it has overlap with NN50 and N50. The claim that index funds have lesser downside protection than managed funds is bogus and based on bad stats. Can you bit elaborate one downside protection with pure index funds. Do you have any study / back testing to prove this is possible in pure index only funds. That’s a good thought. The advantage is it simplifies your portfolio even further – 1 fund instead of two. The disadvantage is you cannot allocate differently between Nifty Next 50 and Nifty 50 if you go with Nifty 100 EW. We like a higher allocation to Nifty Next 50 than Nifty 50 EW. Hope this helps. What happens to the existing portfolio investments when you come up with an update to the recommended funds? To the existing corpus- is that switched? And to the existing SIPs- do we need to start and start them? Yes, you will need to stop old SIPs and start them in new schemes. 1. Read a Forbes article regarding Equal weight indices for the US market. Will it work in the Indian market since it’s heavy with 4-5 giant companies creating the alpha? 2. Not great returns over the past year. 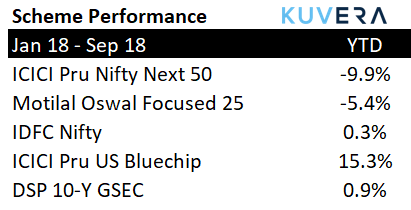 How many years do u intend to keep this in the Kuvera recommend portfolio before we see returns? Equal Weight (EW) index out-performance over Market Weight is seen in pretty much every market globally including US. Even in Indian context, EW Nifty index outperformed Nifty 50 (MW) in 11 of the 17 years since we have data. As Indian markets become less and less liquidity driven and more efficient in processing information, we expect them to behave more and more like other global markets. Last year MW did outperform EW, but the odds are good in a 5+ year holding period that EW will do significantly better. Where can we find your recommended portfolio in the app? Pl advise. You can find it once you plan for goals on Kuvera. It will be recommended to you at the end of goal planning. Can an Index fund sell its stock and hold cash when market is falling or they have to remain invested ? No Viral, Index funds will always remain invested. That is the whole idea, they don’t try to time the market.